Dramatisation of the 2013 Boston marathon bombing and subsequent manhunt. Here's an idea for a drinking game. Take a Peter Berg directed movie and knock back a shot every time you see the Stars and Stripes fluttering in the breeze. You'll be on the floor within 30 minutes. In both his movies and his personal life, Berg has become a rare conservative voice in an industry that likes to think of itself as liberal (women and minorities in Hollywood will argue otherwise). Movies like The Kingdom and Lone Survivor have drawn accusations of Islamophobia, so when it was announced that Berg would film a dramatisation of the events surrounding the 2013 Boston marathon bombing, those unable to get on board with Berg's politics drew a deep breath. 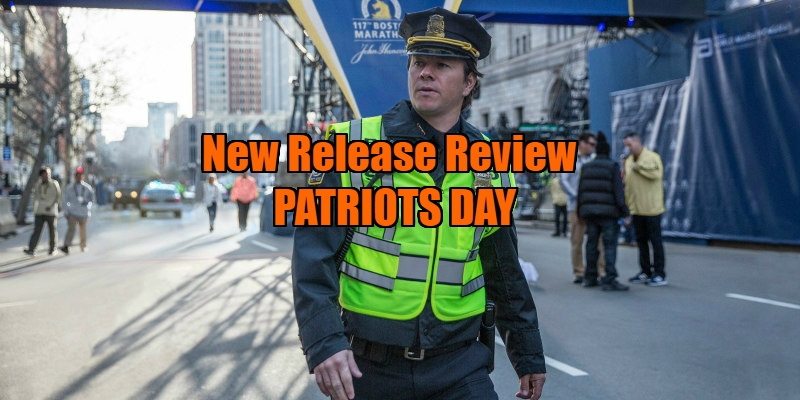 Any fears that Berg might deliver his most tasteless, jingoistic and bigoted movie yet are thankfully unfounded, as Patriots Day (sic) is his most accomplished work to date, and surprisingly, given its title, there's barely a flag to be found in its New England wind. Berg takes us back to April 15th, 2013, when brothers Dzhokhar (Alex Wolff) and Tamerlan Tsarnaev (Themo Melikidze) set off two bombs near the finish line of the Boston marathon, killing three and wounding scores, and guides us through the subsequent manhunt that brought the city to a standstill. The throughline for all of this is fictional cop Tommy Saunders (Mark Wahlberg), present on crowd duty during the detonation and becoming involved in every significant action thereafter. Some have complained about the inclusion of this product of a screenwriter's imagination, and the film boasts a narrative strong enough to survive without Saunders' presence, but for those of us outside the US and less familiar with a story that is sadly but one of many such incidents in recent years, it's not such a point of contention. A variety of real life authority figures play their part, from John Goodman as Boston Police Commissioner Ed Davis to Kevin Bacon as Richard DesLauriers, the FBI agent in charge of the manhunt. The film also lets us get to know some of the survivors, including a young couple (Rachel Brosnahan and Christopher O'Shea) who both lose their legs in the explosion, a father (Dustin Tucker) separated from his son in the downtown chaos and a Chinese student (Jimmy O Yang) who finds himself taken hostage by the Tsarnaev brothers. Earlier in his career, Berg was compared unfavourably to Michael Bay, but with this and last year's Deepwater Horizon, he's proven himself a skilled craftsman. Berg's never been better than he is here, constructing visceral set-pieces that immerse us in the tense drama. The carjacking of the Chinese student is unbearably anxious, particularly if you're unfamiliar with its outcome, and a night-time shootout on a suburban street will have Michael Mann nodding in approval. Trent Reznor and Atticus Ross provide a score that purrs along quietly, adding to the sense of menace without ever overwhelming the visuals. The expected demonising of Muslims is notably absent, and one of the film's most effective scenes involves the grilling of the white American Islam convert wife (Melissa Benoist) of Tamerlan Tsarnaev by a brown-skinned Muslim interrogator (Khandi Alexander) who schools her on her misguided cultural appropriation. "I was born in a tent with three walls; you were born in comfort," are the words with which she mocks the obstinate white convert, who wears her headscarf like a teenager sports their latest favourite band's t-shirt. Those who believe the solution to preventing terrorism is to close borders would do well to pay attention. 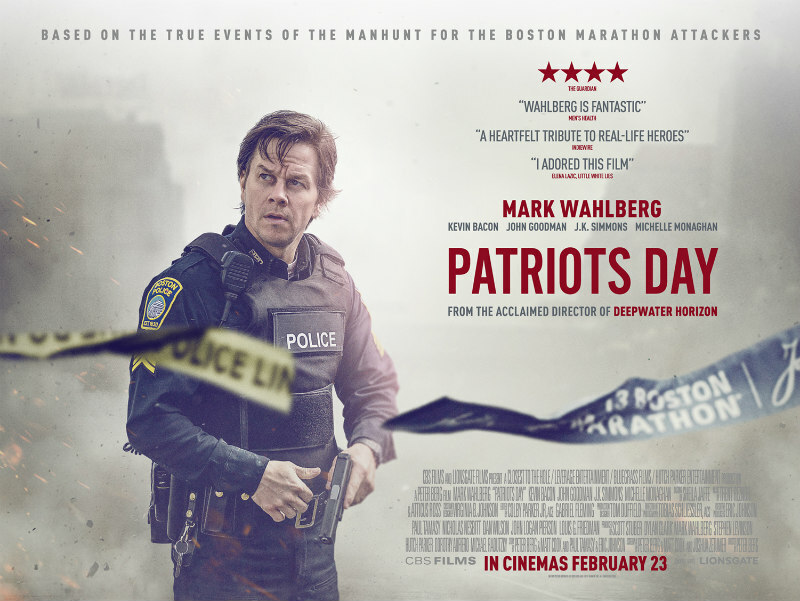 Patriots Day is in UK/ROI cinemas now.